What Happened to Joe Harris? “There is an extra bone in his foot that is causing irritation, and the plan is to have it removed,” said Mark Bartelstein, agent for Joe Harris. According to Cleveland.com, the 24-year-old NBA player “has been experiencing foot pain since the start of the season and recently re-aggravated it to the point where he had to sit out a practice last week.”2http://www.cleveland.com/cavs/index.ssf/2016/01/cleveland_cavaliers_guard_joe.html The pain has been so great that Harris has only played a total of 15 minutes amid five games this season. There are 26 bones in the human foot, but some people have extra bones that can be congenital or due to previous trauma. These bones are usually hidden and asymptomatic. 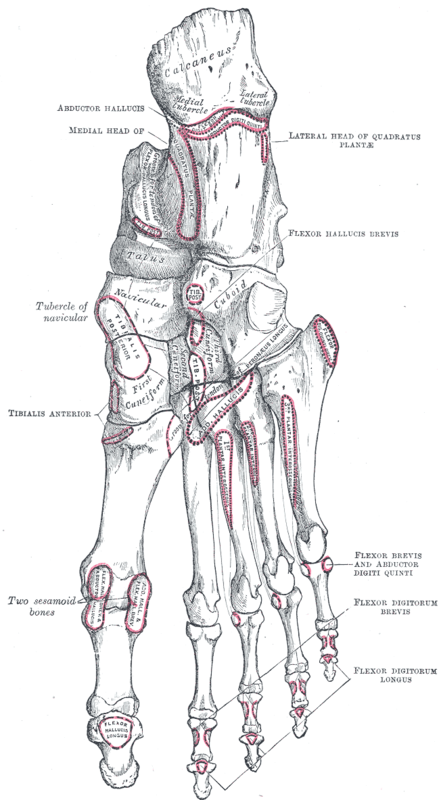 The accessory navicular is the most common extra bone found in the foot; it is located within the posterior tibial tendon on the inner side of the foot, just above the arch. When there are symptoms, patients report visible bony prominence in the area, redness and swelling, and sometimes throbbing pain following activity. Athletes are some of the most likely candidates to suffer problems due to the extra bone since pain usually stems from trauma, footwear rubbing the area, excessive activity, or overuse. Another common cohort of sufferers are those with flat feet or fallen arches, which puts more strain on the posterior tibial tendon. Rest is imperative to recovery, so casting is sometimes advocated to offload pressure and force patients to slow down.4http://www.foothealthfacts.org/footankleinfo/Accessory_Navicular_Syndrome.htm Reducing swelling will work wonders in diminishing that throbbing pain, so icing, oral nonsteroidal anti-inflammatory drugs, and injected steroids are all useful foot pain therapies. Over the long term, you will need to address the root cause of the pain. Physical therapy and orthotic devices typically complement the surgical approach.5http://www.podiatrytoday.com/article/94 Since the extra bone isn’t needed for foot function, it can be removed and any damage to the posterior tibial tendon repaired. The Center for Podiatric Care and Sports Medicine in Manhattan and Westchester has several board-certified podiatric surgeons on staff, including Dr. Josef J. Geldwert and Dr. Ryan Minara. They have worked with Olympic competitors and professional athletes, as well as active New Yorkers who want to maintain a range of motion and reduce pain using the latest techniques and tools the industry has to offer. Contact us to discuss your foot pain. We have a full range of diagnostic tools and complementary therapies to help you.